Anyone with grandeur dreams of rocking a guitar on stage or wailing into a microphone for an encore performance to tens of thousands of adoring fans night after night forget one thing; it’s not easy. The blood, sweat and tears are not just cliché in one of the most demanding and unforgiving industries out there. It’s the truth. Which is why the name MOOCH is the most ironic name for one of the hardest working and dedicated bands hitting the studio, the stage and the gas pedal. The word mooch is mostly associated with scroungers or freeloaders waiting for a handout or asking for what wasn’t earned. 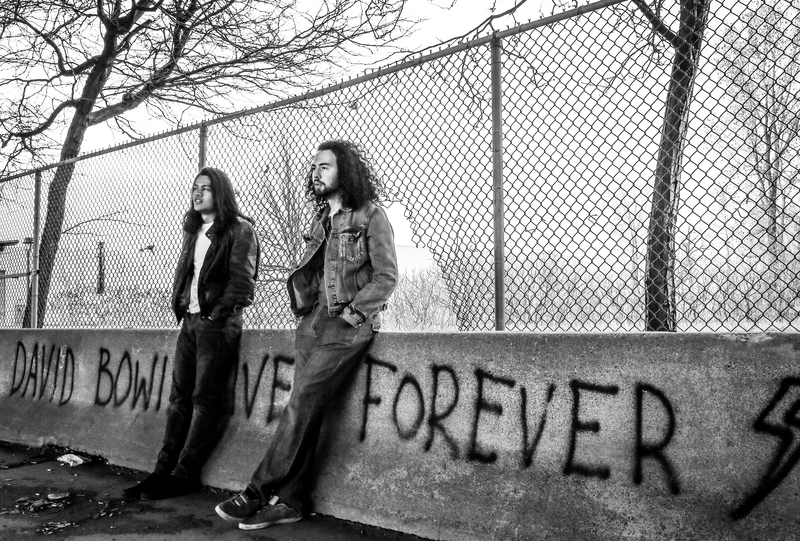 The same cannot be said for the Canadian rock duo known as MOOCH. Driving out of Montreal, Quebec at full throttle, these two are earning their right to go from old beat up van to private jet and limousines one gear shift at a time. Actually, their van isn’t even that beat up. Recently on the road touring various parts of their native land, they entrusted their lives and livelihood to the dependability of Big Blue. No band van can be called a band van unless she has a band van name. Yes, she. 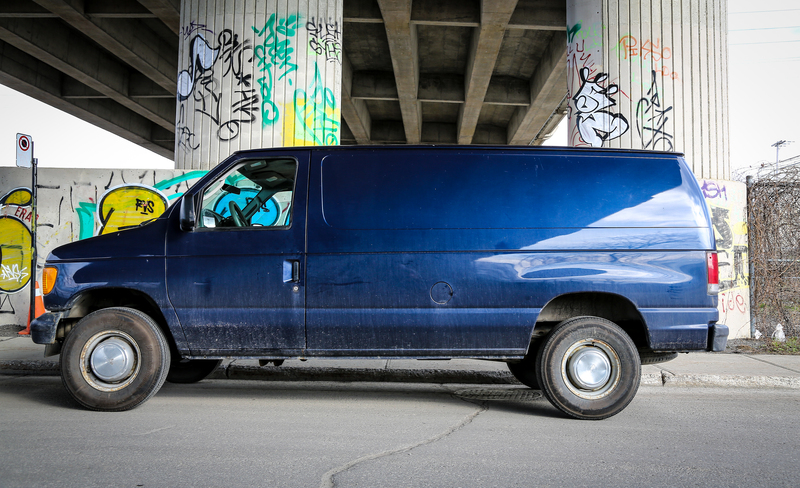 Big Blue is a 2006 Ford E-250 with a 4.6L V8 engine. This navy blue musician mobility vehicle is the very same kind you’d find your local plumbers, electricians, exterminators etc… using. The popular workhorse E series from the Ford Motor Company also known as the Club Wagon or Econoline, was produced from 1961 to 2014 and have housed countless musicians and their gear. 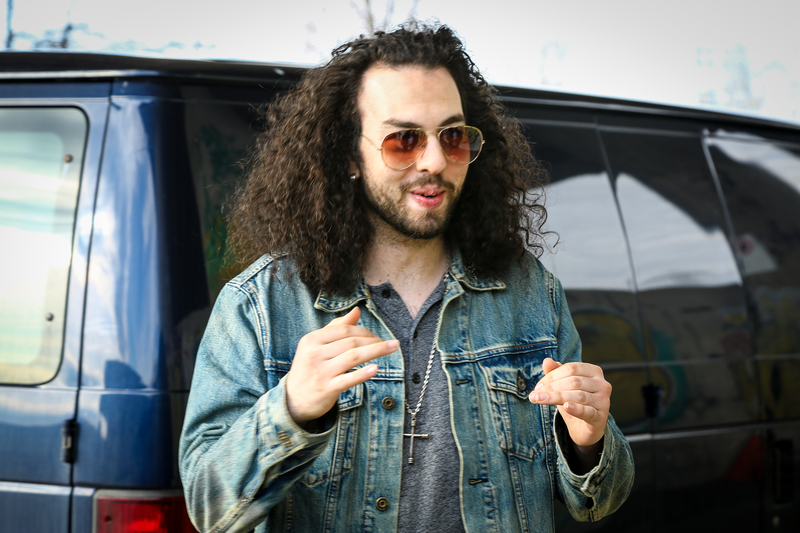 “When you’re on the road for the first time, it can be scary” says drummer Alex Segreti. “Right now, it’s just us two, you know. 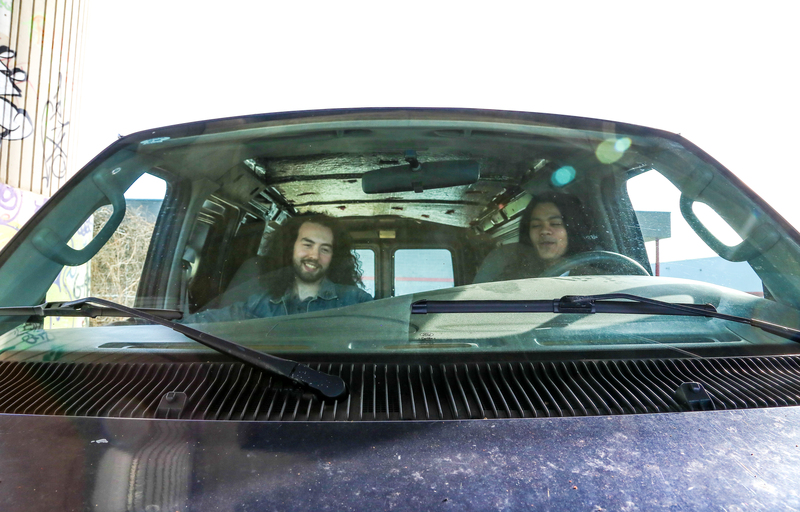 We are the band, the roadies, the drivers and the whatever else is needed to get the show on the road” Segreti exclaims as he thinks back to their first tour. “Yeah, it’s true” confirms singer and guitarist Ben Cornel with a smile, “It’s easy to be to be intimidated by all that has to be done. Especially if you find yourself driving for six or seven hours from gig to gig and you are playing to an empty room. We heard the horror stories of bands playing to nobody, vacant venues. But, we were extremely happy to find we had audiences waiting, wanting to listen to us. To experience us live” continues Cornel. 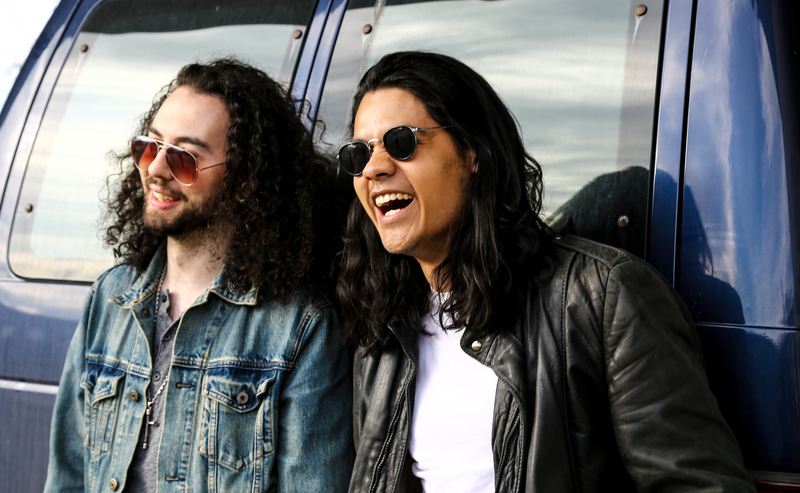 Knowing very well how the music business can be as punishing as it can be rewarding, Ben and Alex just want to make music and share their art, as loud and as powerful as possible. Their unpretentious and calm attitude is a gift not many of their peers have the luxury of, not to mention their Rolls-Royce levels of modesty. “Money is great, but it’s not why we do this” reminds Alex. “I love to perform. We both do. Ben feeds off my energy and I feed off of his and it’s the same when we are in the studio or on stage.” Ben jumps in, “Exactly, money can’t be the goal. You just lose yourself if that’s the ambition. We do what we do because it’s creative, it’s fun and it allows us to be happy and make others happy in the process.” With these words, it makes it that much easier to understand why they spent so much time living, breathing and sleeping in Big Blue. They say it full heartily and without an asterisk, pure and genuine. When life has you booked one night in Quebec City then the next in Toronto, the open road is no spot for the weak and weary. Hours upon hours of driving, sleeping in Wal-Mart parking lots, bathing in the rest area rest rooms and back on the road only to do it all over again. Just Ben and Alex on repeat, city to city, town to town and living in that reliable navy blue Ford. It’s a common thing for up and coming artists to experience the same as what MOOCH is living. However being a duo instead of a trio or quartet for that matter, 50% of all tasks on the road are falling on each of their shoulders whether they like it or not. Rewinding a bit, MOOCH reminds us that they weren’t always a duo. Much of the time was spent as a trio, including most recently Julian Iacovantuono on bass. As they describe it, MOOCH would eventually evolve into a two piece shortly after releasing their incredibly sounding EP titled Timewarp, produced by Segpop Studio. Sounding fantastic at any volume, the time and effort invested is evident in the quality of the recordings. Segpop Studio is owned and operated by guitar virtuoso, producer and Alex’s father, Joe Segreti in Montreal, Canada. “Our record Timewarp came out at the pinnacle of our sound as a trio” states Ben, “Now as a duo, I think the energy and the sound that we deliver on stage will be a lot easier to translate to our future recordings. Guitar, drums, vocals. That’s it. It’s incredibly stripped down, it’s pure, it’s raw.” It is. As great as the recordings are as a trio, the magic translates flawlessly live as a duo. The sound doesn’t feel empty or lacking, it’s exactly as described by Ben. 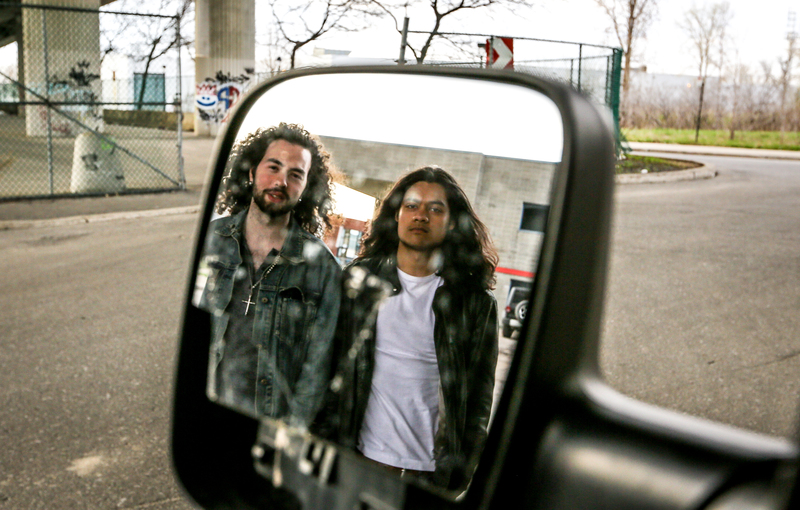 “I hear it on the radio all the time, listening to Montreal’s Chom 97.7 that this is now the age of the duos. I’ll hear Death From Above, the Black Keys and Royal Blood, I feel even more motivated towards what Ben and I were thinking going forward” acknowledges Alex. Again, further truth towards the trend and new stance for what is rock n’ roll normality since the mid to late 1990s has become. 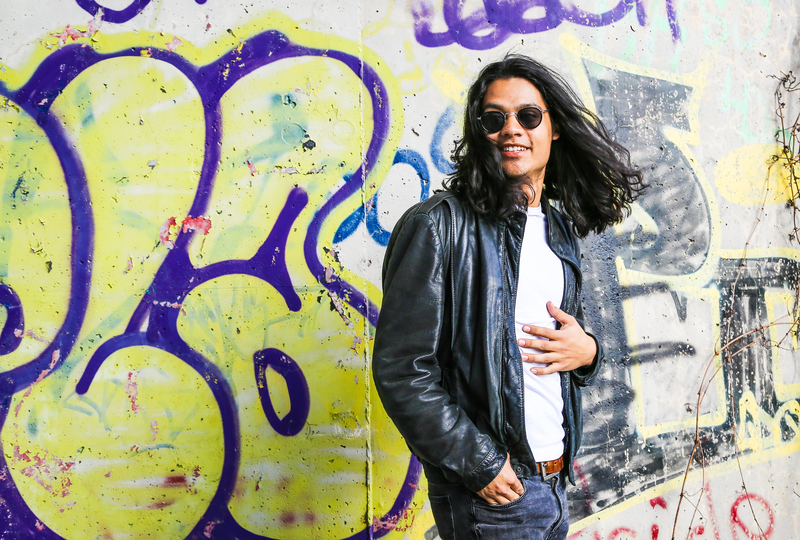 Underground and mainstream are feeling the effects of such acts mentioned by Alex as well as the White Stripes who are considered pioneers for the genre. It seems MOOCH has Big Blue pointing in the right direction as they embark on the journey ahead. 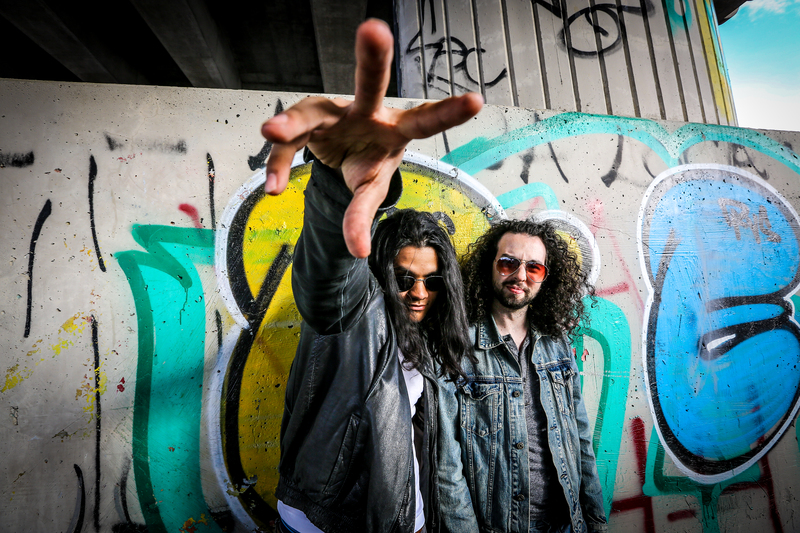 Their supercharged high velocity desert rock sound has influences from a wide spectrum of artists such as Kyuss, Black Sabbath, Alice In Chains and Led Zeppelin. It almost makes you wonder if that energy alone is what’s fueling their trusty E-250. Probably not, but it wouldn’t surprise anyone that knows them if it did. 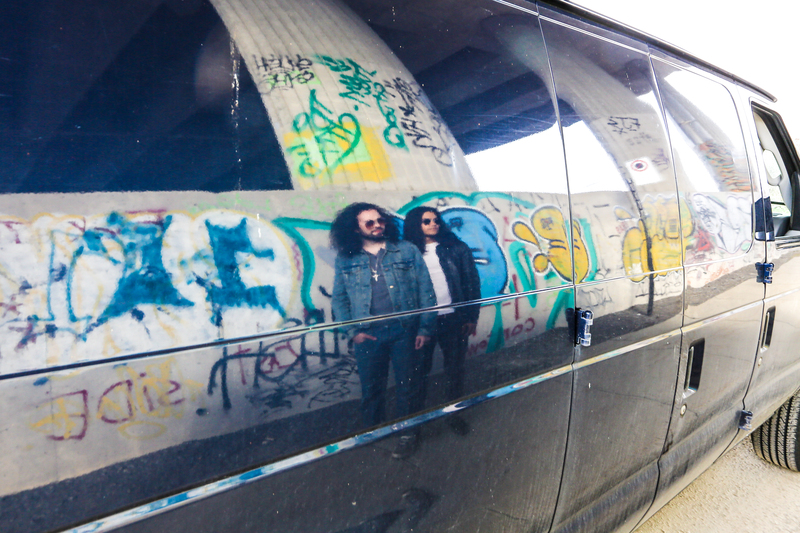 Fusing fuzzy and groovy sounds with grungy and psychedelic ones have built a smooth yet torque heavy monster of a machine in MOOCH. With Big Blue and the band getting ready for future dates in and around Canada for the summer of 2018 as well some studio recording dates confirmed for the first time as a duo, the pedal is to the floor. They proudly announced in May 2018 they will be in California recording with none other than Brant Bjork formerly of Kyuss, Fu Manchu and Vista Chino. Big Blue might only have a respectable 225hp at around 4800rpm, but MOOCH is shattering the tachometer and about to redefine the definition of the red line. There are definitely no moochers in MOOCH, just two drivers, figuratively and literally.